The IBM Infoprint 2000 is a high-end, 110 page-per-minute, cut-sheet publishing system. The IBM 2710 Infoprint 2000 Multifunctional System Printer Model MS1 replaces the NP1, RP1, and non-Intelligent Printer Data Stream (IPDS) DP1 models. Model MS1 can be configured as a high-speed duplicator or production printer when network or channel attached to a host delivering PCL 5/6, PostScript level 3, or Line Condition Datastream (LCDS)/Metacode datastreams. Host attachment for Model MS1 is available using 10/100BaseT Ethernet. System/370 Parallel or ESCON Channel is available through the BARR or Sun hardware. The additional flexibility of the Infoprint 2000 gives you the ability to create professional quality documents, even with complex multistock composition, at speeds up to 110 pages per minute. 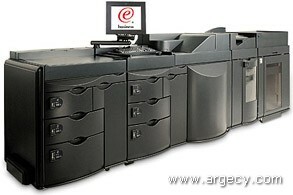 The Infoprint 2000 is a high-end, 110 page-per-minute, cut-sheet publishing system. It can be used as a full-function standalone duplicator, a high-speed network printer, or a channel-attached data center printer. Depending on the model and configuration ordered, the Infoprint 2000 can include a Scan Station for document scanning, a finisher and optional booklet maker for complex duplication, and a post-fuser Inserter Module for inserting printed pages into the finished document. The Multifunctional System Printer Model MS1 replaces the NP1, RP1, and non-Intelligent Printer Data Stream (IPDS) DP1 models. Model MS1 can be configured as a high-speed duplicator or production printer when network or channel attached to a host delivering PCL 5/6, PostScript level 3, or Line Condition Datastream (LCDS)/Metacode datastreams. Host attachment for Model MS1 is available using 10/100BaseT Ethernet. System/370 Parallel or ESCON Channel is available through the BARR or Sun hardware. After December 14, 2001, IPDS Microcode Upgrade will be shipped as standard on all AF1 models. However, for AF1 printers shipped prior to that date feature number 4255 must be ordered to allow field installation of the upgrade code. An optional enclosure unit for the controller, hub, modem and exposed cables is being made available for all models of the Infoprint 2000. The IPDS Microcode Upgrade, FICON attachment, and paper size kits are also being made available for Model DP1 printers that have IPDS installed. The Infoprint 2000 production publishing system is built upon a high-quality, high-speed, cut-sheet printer that can be used as a standalone duplicator, network printer, or host datacenter printer. With rich finishing and page insertion features and a variety of available host attachments, the Infoprint 2000 offers significant flexibility in document creation. Two models, MS1 and AF1, replace models previously available to offer simplification of ordering and configuration, and increased function. Model MS1 replaces Models RP1, NP1, and non-Intelligent Printer Data Stream (IPDS) DP1 printers. Model AF1 replaces Model DP1 printers that have IPDS installed. Models MS1 and AF1 have eliminated the need for Printer Solution Offerings available on previously announced models of the Infoprint 2000. High-speed digital duplicator in corporate reprographics centers, in-plant print shops, and the print for pay market. Networked printer aimed at the large office workgroup and data center environments where PostScript, PCL, or Xerox native LCDS/metacode are the predominant data streams. This includes ERP installations like PeopleSoft and SAP as well as non-IBM data center environments. Model AF1 is intended as a network or channel attached production printer supporting the IPDS via the Advanced Function Common Control Unit (AFCCU) controller. The Model AF1 includes IPDS support for the Inserter Module, which was not previously available in the Advance Function environment. The Infoprint 2000 AFCCU controller receives print information from the host system in the form of IPDS, which is an IBM host-to-printer data stream designed to manage and control printer processes. It supports all points addressability, giving it the capability of placing data at any defined point on the valid printable area of a page. IPDS is a significant feature because it allows both data and commands to be sent to a host-connected printer independent of the attachment protocol used. The High Capacity Stacker, available on the Models MS1 and AF1, provides an additional 5000 sheet stacker. It allows copied or printed sets to be offset or straight stacked. The rotator unit in the stacker rotates paper 90 degrees for the correct orientation into the Booklet Maker of Model MS1. The High Capacity Stacker also allows for the continuous output function described under IPDS Microcode Upgrade below. With the installation of IPDS Microcode Upgrade, available on December 14, 2001, the Inserter Module is supported on Models AF1 and DP1 that have feature number 4250 installed. The SSC, available on Model MS1, is used to control an associated Scan Station (#4290 or #4291) or Production Scan Station (#5290 or #5291). Each scan station requires a dedicated SSC. The SSC can be either customer supplied or ordered as features from IBM. Two different Scan Stations are offered on Infoprint 2000 Model MS1 to accommodate varying levels of scanning requirements. The Xerox 620S Scan Station (#4290 or #4291) will scan up to 20 PPM in simplex mode at 600 dpi resolution. Its automatic document feeder accepts up to 50 sheets of 20 pound stock. The Fujitsu M4097D Production Scan Station (#5290 or #5291) uses dual-optic functionality to scan both sides of the document at once for faster two-sided scanning at up to 65 PPM. This single pass scanning provides a more reliable paper path. Each installed Scan Station requires a dedicated SSC which may be purchased as #4390, or #4391, or customer supplied. The Signature Booklet Maker, available on the Model MS1, allows for the creation of booklets by saddlefolding and stapling supported paper sizes. Provides an additional dolly for all models to assist in loading and unloading the high capacity stacker. After December 14, 2001, the IPDS Microcode Upgrade will ship installed on the base printer Model AF1. Feature number 4255 is a field installable feature for Model AF1 printers that ship prior to that date and for DP1 printers that have feature number 4250 installed. Continuous Output between the finishing unit and High Capacity Stacker to allow the marking engine to continue the printing process upon a stapler or stacker unlock or full condition. This function attempts to switch output devices on job boundaries, allowing the operator to address the reason that generated the switch without interrupting the print process. Continuous Output can be enabled or disabled by the operator. Continuous Output cannot be used while stapling or with the following paper sizes: Ledger, A3, RA3, 17x14, 12x18, or 14x18. The Inserter Module allowing page insertion operations to be controlled within IPDS. Additional paper sizes of 8x10, 8.5x10, RA4, RA3, 14x17, 12x18, and 14x18. The ability to select one of two IP addresses to eliminate IP address conflicts. Attachment to a host using the FICON attachment feature. The following chart defines the paper sizes supported by the Infoprint 2000. Note: (1) Requires appropriate paper size kits. You should purchase quality, brand name paper and products that are made and labeled for use with high speed xeroxgraphic copiers and printers. Prepackaged, cut-size, xerographic papers will generally meet the controlled specifications for high-speed xerographic imaging, and will not vary in quality within or between shipments or lots. Large, quality-conscious manufacturers will generally stand behind their products' performance guarantees. Note: When you are printing on die-cut tabs, pages must be run simplex (one-sided) to prevent sheets from jamming. Note: If you use recycled paper, IBM recommends a recycled Xerographic or copy grade paper manufactured for use in high-speed printers. The papers that perform well have a 50% total recycled fiber content and may have 10% post consumer waste. Refer to the Site Preparation and Configuration Guide (MS1) or the Planning and Configuration Guide (AF1) for specific weights and sizes that are supported. The space requirements for the Infoprint 2000 depends on the options installed. Space requirements for the base printer are 20.5 feet (6.2 m) by 10 feet (3.05 m). Space requirements for the maximum configuration (Scan Station, High Capacity Stacker, Signature Bookletmaker, and Inserter Module) are 33 feet (9.9 m) by 10 feet (3.05 m). Note: The base model requires 3-phase, 5 wire electrical service with ground AND neutral. Note: (1) Consists of paper input module, printing engine, memory, finisher, SCS, operator control interface, network connectivity. Hardware RequirementsIn the following sections where feature numbers are listed "#xxxx or #xxxx", the first number is for plant installation and the second for field installation. The Infoprint 2000 Model MS1 can attach to a host through either a personal computer using (feature number 4110 or 4111) a Sun Channel Controller (#6110 or #6111), or a Sun ESCON Channel Controller (#6150 or #6151). The printer accepts PCL, PDF, or Postscript. Any LCDS/Metacode is converted before being delivered to the printer by the controller, which delivers Postscript to the Printer Controller using an Ethernet connection. With this configuration, the Printer Controller must be running the LCDS/Metacode Channel Software Enablement version of MIS Print Software (#6120 or #6121). The Infoprint 2000 can attach to the host using TCP/IP. The Infoprint 2000 MS1 must have the LCDS/Metacode TCP/IP Software Enablement version of MIS Print Software (#6120 or #6121) in the Printer Controller. All current publications will be updated with technical newsletters. The publications listed below will be available at announcement. You may obtain these publications from your IBM Printing Systems Division representative. The publications listed below will be shipped with the product. IPDS publications ship with Models AF1 and DP1. Updated versions of the User's Guide and Quick Reference will be available by December 14, 2001. For additional copies, contact your IBM Printing Systems Division representative. For a current list of publications, contact your local IBM representative. Prerequisites: Each Scan Station requires a dedicated Scan Station either Customer supplied or Controller FC 4390 or 4391. (#4624, #4625) Multiple Stackers Attachment (Initial / MES)This feature provides the capability to attach up to three high-capacity output stackers. Without this feature, each printer can have only one high-capacity output stacker. More stackers reduces or eliminates stopping the printer to empty the output stackers since when one stacker is full, output flows to the next stacker. The capacity of each High Capacity Stacker is 5,000 sheets. and the capacity of the Finisher is 3,000 sheets. The maximum output capacity with the Finisher and three High Capacity Stackers is 18,000 sheets (3,000 sheets with the Finisher plus 3 x 5,000 sheets for each High Capacity Stacker). This feature must be ordered once to attach the second High Capacity Stacker (feature number 4620 or 4621), and ordered a second time to attach the third High Capacity Stacker. This feature is not used to attach the first High Capacity Stacker. Operation of the printer can continue after stacker #1 is full if stacker #3 has been emptied before #1 is full. Maximum number of feature allowed: Two per Infoprint 2000 unless the Bookletmaker (feature number 4720, 4721) is also installed. Only two high-capacity stackers are allowed when the Bookletmaker is also installed, so the maximum number of this feature is one (1) when the Bookletmaker is installed. The Bookletmaker is available on the Model MS1. At least one high capacity stacker (feature number 4620 or 4621). Limitations: The continuous operation mode, that can be enabled by an operator to allow printed output to switch between the finishing unit and the high capacity stacker, cannot be used while multiple high-capacity stackers are powered up. Description: Used to create booklets by saddlefolding and stapling documents. Compatibility conflicts: Not available with FC 4250 or RPQ 8B4112. (#4830, #4831) Roll Feed Input Attachment (Initial / MES)This feature allows the attachment of a roll feed input device to to the Infoprint 2000. The roll feed device must cut the media to a size acceptable to the Infoprint 2000. This feature uses drawer #5 in the Paper Supply Module and drawer #5 is not available for other uses. Maximum number of feature allowed: One per Infoprint 2000. Description: Kit to vent heat from printer to outside. Prerequisites: Each Scan Station requires a dedicated Scan Station Controller either Customer supplied or FC 4390 or 4391. Description: Used to channel attach a non-IPDS printer. Description: Used to parallel channel attach a non-IPDS printer. Description: Used to attach a non-IPDS printer via TCP/IP. Description: Used to provide a cost effect solution for complex printer installations. Contact your IBM Printer Representative to determine if it is appropriate for this installation. Choosing the right supplies is very important. For optimum print quality and reliable performance, the use of IBM supplies is recommended. Supplies are purchase-only items. The customer is responsible for ordering and maintaining an adequate stock of supplies. Many Authorized Supplies dealers offer supply agreements, and Supply agreements often offer customers price discounts, price protection, established shipping schedules, and reduced administrative expenses. It is recommended that customers maintain a one to two month stock of supplies on hand. Materials Safety Data Sheets (MSDS), (OSHA Form 20), for the Infoprint 2000 supplies with the IBM logo are available in the U.S. by calling 800-IBM-4333 (426-4333). You will need to provide the seven-digit part number or the machine type and model number and supply type, for example, Infoprint 2000-AF1. Outside the U.S., contact your local supplies dealer. Each supply for Infoprint 2000 is listed below. Actual life of each item will be dependent on several variables in the customer's environment and applications. These life expectations are based on running 8.5 x 11 inch paper with 6% coverage. Warranty for all supplies is one year from the date of purchase stated on the purchase receipt. Supply warranties are only for defects in materials and workmanship at the time of shipment and are not for normal wear and tear, nor for any usage minimum. IBM supplies are manufactured to very high quality standards. However, if you believe you are due a warranty return, you should return the supply in its original package or a package from the replacement supply to your point of purchase with an explanation of the problem, a print sample, and the approximate impressions run on the supply. For paper recommendations, see the Forms Design Reference for Cut-Sheet Forms (G544-3921). For additional information on ordering supplies, see the Infoprint 2000 Planning and Configuration Guide (G544-5765). Trademarks (R), (TM), * Trademark or registered trademark of International Business Machines Corporation.